Ketchup The Latest: Beware of Text Scams!! Be vigilant against text scams on supposed “discount,” “refund,” “prizes,” “stranded relatives” and other falsified claims disguised as share-a-load transactions. I believe that most of us have received at least one SMS message like those ones mentioned above and sadly,many have fallen prey to these "scammers". It pays to know and be alert so we can stop them from doing these fraudulent activities. 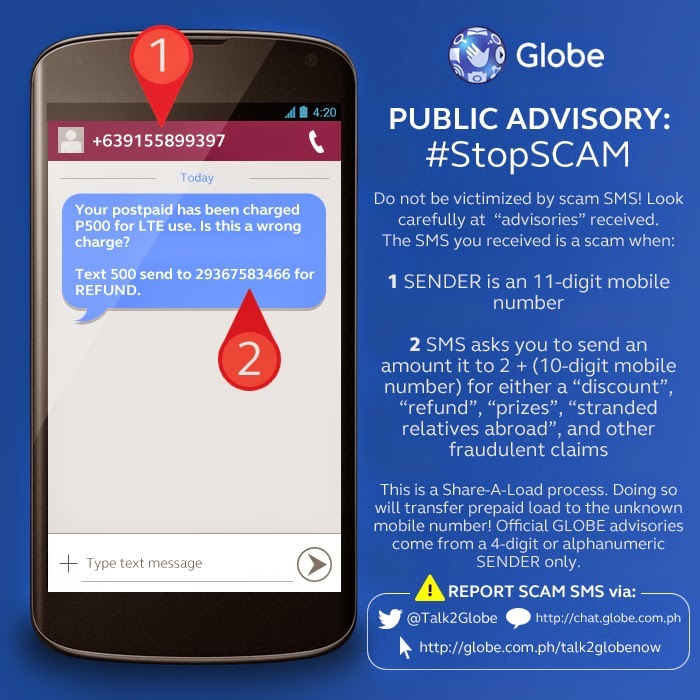 In the case of supposed “discounts” or “refunds”, Globe Telecom emphasized that legitimate advisories from the telecommunications provider are labelled from “GLOBE” and do not come from 11-digit numbers. Subscribers may validate unusual texts and calls with the company’s customer service agents. Regarding spam messages that include text such as “send to 2915XXXXXXX,” by adding the number 2 before the 10-digit cell phone number of the recipient, the unsuspecting subscriber would have done a Share-A-Load transaction. Another text scam informs customers that they supposedly won in a raffle contest they never participated in and the text message provides “steps” on how to claim the prize. Another text scam involves relatives working abroad supposedly using a new prepaid number, also aimed at tricking subscribers into doing a Share-A-Load transaction. Globe customers are advised not to respond and, instead, immediately report suspicious text messages to authorized Globe customer service channels. Customers may report mobile numbers used in sending out fraudulent or scam text messages. Globe customers may report via the Globe website through Talk2Globe Chat (http://chat.globe.com.ph), send a message through Globe Contact Form (http://globe.com.ph/talk2Globenow) and tweet @Talk2GLOBE on Twitter. good for us who are aware of such scams and it really pays that networks should make infodrives and announcements as such to avoid being a victims of text scam. Even text are being used by scammers, pretty bold isn't it? I would be milti billionaire if I replied to a lot of email lottery winnings notification I've received lol. I always get scam texts and I just ignore them.